Not too long ago, Grant borrowed from his older daughter an Xbox 360 game called Assassin’s Creed (Ubisoft Publisher) which recently released in November 2007. It has become one of the most popular games today. He managed to go thru first stage of game “How to play with controller” episode before start real game. Once he entered, he got lost and confusing because several characters kept talking to me thru the game – he just gave it up and returned game back to his daughter. He looked up Google and found out he’s not alone – there are many complaints at Ubisoft official forum. He made his part by register and made the comment. It is not just about deaf and hard of hearing who need subtitle, there are many foreigners that are not good with English – they depend on subtitle to play. 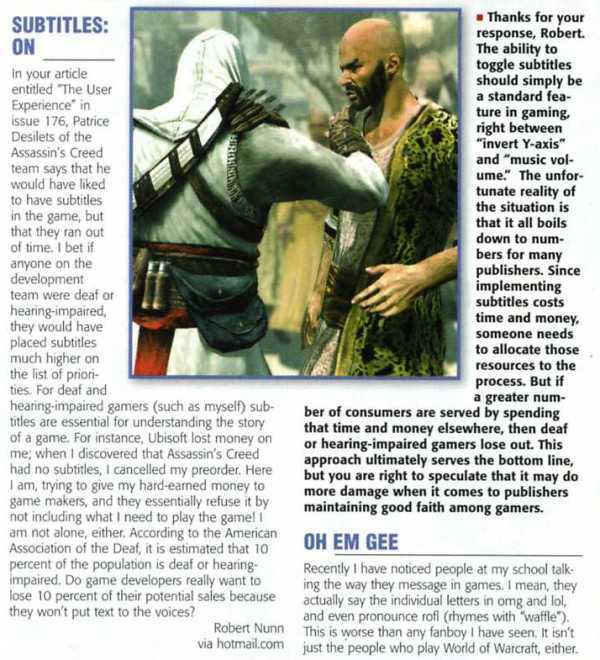 Grant applauded commenter Robert Nunn who wrote to “To the Editor” on Game Informer magazine (February 2008 edition; page 12) regarding lack of subtitle on this game. Hopefully it will push Ubisoft to offer subtitle patch/upgrade in near future. To see scanned article from magazine, click here. Did you know that many store such as Wal-mart of Target will not honor opened game box regardless? Several Deaf gamers purchased and got stuck with it. If you purchase game thru GameStop store, you might have little luck. Ironically, Assassin’s Creed – Nintendo DS version now support subtitle.